A safety campaign where people feeling unsafe on a date can discreetly ask for help using a code-word is being rolled out across the UK. It works by allowing people to ask venue staff for 'Angela' if they feel uncomfortable and workers will call a taxi or help them leave discreetly. The campaign is the brainchild of Lincolnshire County Council and has been successfully trialled in Lincoln. Campaign material is available on the National Pubwatch website. The county council said the sexual violence awareness campaign has attracted a lot of interest around the UK, including from the Met Police in London. Pubs in the boroughs of Merton and Wimbledon are among the first to sign up to it. The authority has also received enquires from police and safety organisations who want to use the campaign in Australia, Canada, America, Argentina and Germany. 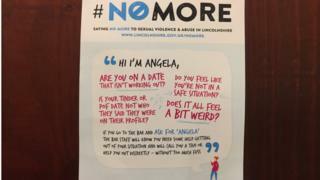 Hayley Child, Sexual Violence & Abuse Strategy Coordinator for Lincolnshire County Council, came up with the idea and is delighted with the response it has received. "We'd seen that a few individual pubs around the country had done similar messages at the bar saying that if people's dates weren't going well the bar staff would help and call them a cab," she said. "We wanted to do this in a more organised way." She said the popularity of dating apps like Tinder meant more people might find themselves in difficult situations, adding that "feedback suggests having the scheme in place makes people feel safer". The posters, which are a play on the word (guardian) Angel, are displayed in both male and female toilets.